Astro Manufacturing and Design is committed to providing our customers with the latest in cutting-edge technology and machining. We have state-of-the-art Electrical Discharge Machinery (EDM) technology, providing a complete family of EDM machinery that will accommodate a wide variety of needs—all with CNC capabilities. With both wire EDM and sinker EDM processes we fulfill the most unique projects. Wire EDM is ideal for producing complex designs on hardened materials. 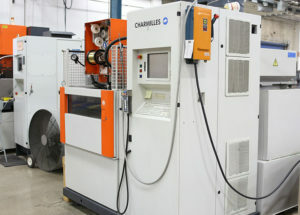 Our advanced capabilities include a range of high-speed production machines. These machines offer cutting areas of up to 48” x 25” x 16” in height and accommodate up to 30° taper cuts. New state-of-the-art four axis programing for wired EDM machines integrates your CAD files for increased cost savings and quick turn-around on production parts. Our experienced machinists can offer design modifications to help ensure you receive the most cost effective machining available. Contact us today to learn more about Astro Manufacturing & Design’s wire EDM services.